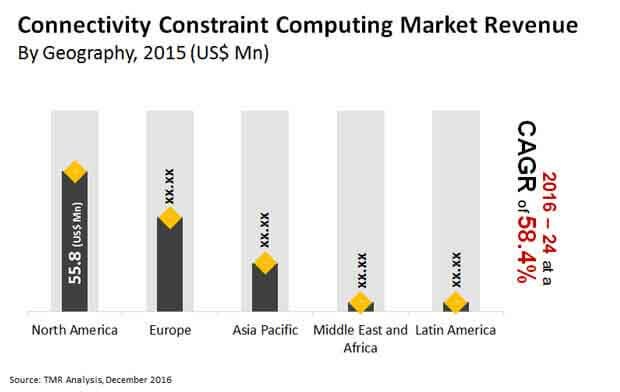 The global connectivity constraint computing (CCC) market has been forecasted to be primed for a statuesque growth by some of the trends currently adopted by industry competitors such as Amazon, TCS, and Cognizant. Market players are assessed to leverage the need to reduce dependency on human resources through increased automation. CCC is highly demanded in military, data management, and financial markets for resolving the problems of complex systems, such as those requiring faster interactions and algorithm combinations. Players could also compete based on products that offer forward thinking and high precision in analysis to overcome overconfidence bias and other human tendencies. In a report authored by Transparency Market Research (TMR), the world CCC market has been predicted to be positioned at US$7.03 bn by 2024 after being valued at US$0.17 bn in 2016. This growth of the market is expected to run at a massive CAGR of 58.4% throughout the forecast period. The dominant need for automation in the data maintenance and accumulation sector has been anticipated to raise the hopes of players in the global CCC market. The inclusion of CCC will allow greater reduction in analysis cost and time and telling increase on the part of time accurate results. The precedence of artificial computing over manual analysis methods could offer bankable opportunities for market players as CCC eliminates the influence of personal choice and vested interests in decision making. Besides reducing the possibility of error, artificial computing can be repeated for a multiple number times to attain analogous alternatives. The ability to solve a gamut of connectivity constraints by constructing accurate solutions and clustering common attributes in a given subset has helped CCC to rake in a whole lot of demand. CCC also helps in cost minimization while offering unique solutions to deal with miscellaneous constraints in aggregate. The international CCC market is likely to gain a staunch impetus with the need to assign time-variant constraints and work with a comprehensible and competent futuristic model. With new opportunities conveyed to policy makers and business leaders due to investments in the infrastructure development sector, the global CCC market could be poised to clasp a commanding growth. The analysts have elaborated on the most subjugating deterrents of the world CCC market, which could include the high expense of CCC methods, high volume and multiple sets of data causing computational problems, data reliability worries, and time consuming data accumulation process. Nevertheless, the report authors have also encouraged the interested parties by providing an important analysis of key opportunities for keeping themselves surfaced in the CCC market. Of these include the soaring demand for CCC in urban planning and infrastructure development. A large demand has also been projected to arise from ecosystem services, especially those planning on connected wildlife corridors, which are in need of both connectivity and constraints. CCC finds a vital usage in software packages for formulating a flexible algorithm that can be applied in any optimization process. As data sets are made compatible and standardized, their reusability is envisioned to further an opportunity for the adoption of CCC.